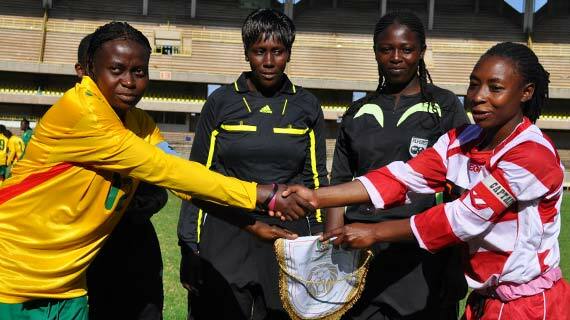 As listed on the CAF official website, The Kenyan senior women’s team was scheduled to play against Mozambique in an African championship preliminary round qualifier last weekend. However this was never to be as Mozambique was given a by to the next round following the withdrawal of the Kenyan team by the local Federation FKF. As Listed, Kenya was to host Mozambique in the first leg match in Nairobi at Nyayo stadium on the weekend of 13th, 14th and 15th January 2012 and the return leg a fortnight later in Mozambique. According to FKF technical director Patrick Naggi, Kenya decided to concentrate more on the U-17 and U-20 qualifiers for the sake of building a future team. He said the federation’s calendar is too congested and could not accommodate another team in the qualifier for now though he promised the senior players will also get a chance to play soon. “ We have an U-17 team playing against Nigeria this coming weekend in Nairobi and the U-20 team awaiting Zambia in the second round next month. We did not want to congest the planning and do a bad job. We urge the players in the senior team to understand but we are working on logistics to ensure they also get representation soon.” Said Naggi. The Kenyan U-17 team qualified for the second round after Mozambique withdrew in the last minute of the first round qualifier while the U-20 team gained their second round slot after cruising past Lesotho in 2011.